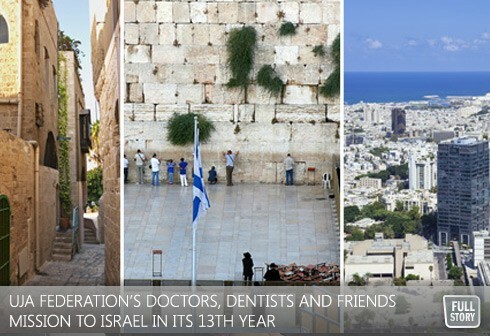 By Daniel Koren--Celebrating its Bar Mitzvah this year, UJA Federation of Greater Toronto’s annual Doctors, Dentists and Friends Mission to Israel will bring participants to on an action-packed and exciting journey that offers a deep and meaningful insight of the country. “When Howard Price and I started this mission 13 years ago it was just a dream but it has now become a yearly reality,” said the Mission’s Chair and co-founder Irving Gottesman. This year’s mission will take place October 13th – 20th. The itinerary includes a tour of the Supreme Court, a Jeep tour in the Judean Desert, a visit to UJA supported projects in Sderot, a special visit to an army base, a hike at Ein Gedi Nature Reserve, a tour of the Knesset (Israeli legislative branch), visits to the Western Wall and Yad Vashem, a walking tour of the Old City in Jerusalem, and much more. To learn more about this once-in-a-lifetime opportunity, join the Doctors, Dentists and friends for an informative session on Monday, March 4 at 7:30pm in Tamari Family Hall at the Lipa Green Centre. RSVP to Eyal Golan at egolan@ujafed.org or 416.635.2883 ext. 5136. A minimum household gift of $3000 to UJA’s Campaign 2014 is required to join the Mission.